In ancient times there lived a Mahatma by the name of Maharishi Kanad. He had the absolute distinction of exponentially increasing the treasure base of Indian knowledge by scripting the Vaishesik Sutras. That determined the rights and the wrongs in a human life. In terms of discovering the absolute good, required for the betterment of man. He had many shishayas (pupils) that included both men and women, and they all owed, their esteem allegiance, to the Mahatma. Among his shishayas there was a beautiful woman also. Who used to look after the Mahatma with all sincerity. But slowly. She started feeling as if she was falling in love with the man. But was unable to express her feelings in front him. Moreover, she was even scared that the Mahatma might suddenly shun her. If she expressed her feelings and that will also give an opportunity to other shishayas to make fun of her. The Guru was shocked at what the lady had just told him. Because of which, he went quiet. And the unexpected utterance of the lady, had even spread like a ‘jungle fire’ in the hermitage. Now, all the shishayas were eagerly waiting to know, what would be Mahatma’s reply. Upon, hearing these lovely words of acceptance. The lady was on top of the world. She came out of the cottage. Where, the rest of the female shishayas, were now jealous of her. As they too wanted to share her luck. Next day after decking up when she felt no one is in Mahatama’s cottage. She entered. But, rest of the shishayas were keeping a constant track of her. When they saw her entering the cottage. They quietly assembled to ascertain what was going on. The lady could see that the Mahatma was in samadhi and all around him, there was a halo of light. In that he appeared like the bright Sun that excited her. She suddenly ran towards him in full enthusiasm trying to embrace him. But alas: What was that? She then saw, she was only embracing herself. When, suddenly, she felt the Mahatma was all over the sky. Where, she, just couldn’t hold the sky nor could she embrace the sky. Even after trying from all the ends she could only experience, as if she was trying to catch hold of the endless sky. But all was in vain. And after a little while. She was tired and stood there wonder struck. She then heard a loud laughter in the cottage. And that is when the Mahatma said, ‘my dear shishaya. You forgot the basic essence of life. Guru is not a personal property of anyone. In fact he belongs to everyone. He is divine, who is everywhere, but not visible. He is the route to your destiny. But not your destiny or your kismet. Guru, makes you farsighted. So share me with everyone. And don’t try to control me. Feel my wisdom and knowledge within you. After hearing such divine sermons from the Mahatma. The lady who until some moments back, was dull and gloomy. Immediately, cheered up, and with her fellow shishayas started celebrating the occasion, and praising the Guru. Thereafter, slowly the Mahatama returned to his embodiment. When he too joined the celebrations. This story is lifted from a mythological article. It conveys. 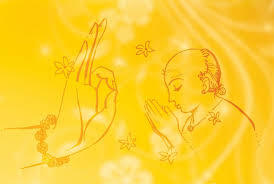 Our relation with our Guru, which is quite different than our relations with others. Today is Guru-punima. Therefore a tribute to every Guru.